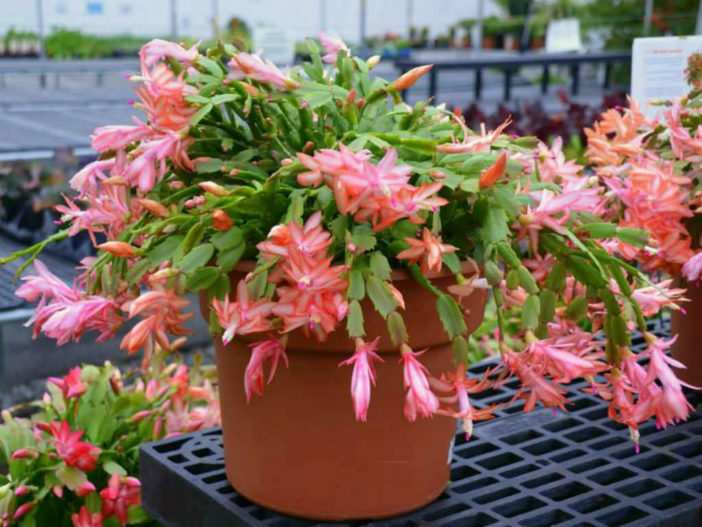 Schlumbergera truncata, commonly know as Thanksgiving Cactus, is one of the Holiday Cacti that you may find in garden centers in the fall. This plant got its nickname from their willingness to bloom in late November, around Thanksgiving. Similar in appearance and culture to their cousins, Christmas Cactus and Easter Cactus, Thanksgiving Cactus can be long-lived and are even sometimes passed down as family heirlooms. Though they thrive on kind neglect and bloom best when pot-bound, you should repot Thanksgiving cactus roughly every 3 years to prevent soil compaction or any time that the plants’ roots protrude from the bottom of the pot. Wait to repot until after blooms have faded, but before new buds develop. Depending on your plant, this is generally in early spring. Thanksgiving Cactus often bloom best when pot-bound. Do not repot them unless absolutely necessary. Fill the new pot with enough potting soil to allow the plant to sit at the same height it was in the old pot. Set the plant on the soil in the bottom of the pot and gently fill around it until it can stand upright unsupported. Water the pot to settle the soil. Add additional soil, if needed. Give the Thanksgiving Cactus a shot of liquid fertilizer mixed at half strength to help with transplant shock. Continue fertilizing monthly until late summer.